I was bored one day and was in the mood for something cheesy. 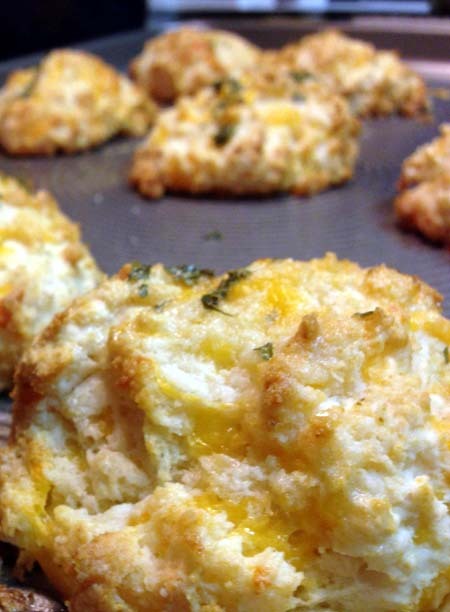 From searching YouTube recipes, I came up with these delicious cheddar biscuits from FifteenSpatulas.com. They make fantastic snacks, breakfast, side dish and appetizers. Just to note, I didn't have buttermilk at the time, so I just searched for a substitute and I found this recipe from Food.com. Also, I didn't have enough scallions as the original recipe recommended, so I used what I had. And lastly, I needed to do a better job shaping the biscuits for when it's cooked. As it stands, I simply spooned them onto the baking tray.